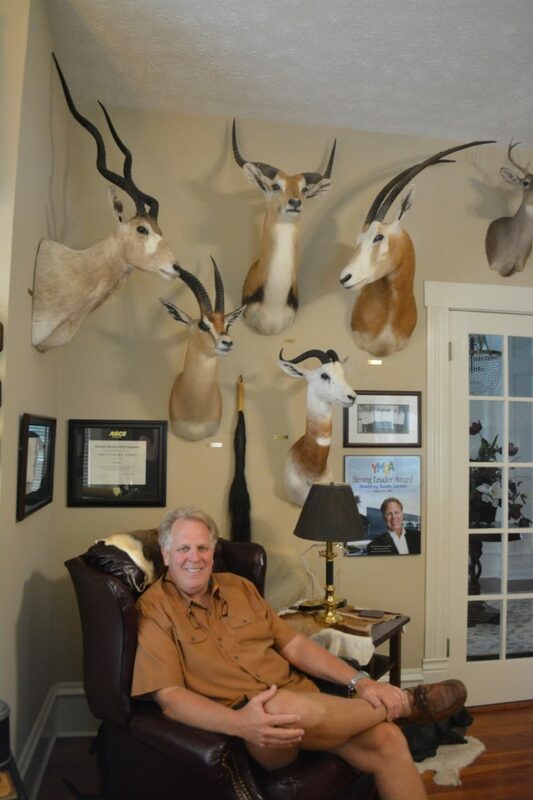 When Randy Larson’s son, Jesse, approached him with an interest in hunting, the former Plant City mayor took it upon himself to teach Jesse each animal is God's creation. The hunting trophies are mounted and labeled on the office walls in Randy Larson’s Franklin Street home. There’s a European stag and a wildebeest; blesbok and nyala antelopes; kudu, a woodland antelope. “They’re mine and my son’s,” Larson, a former Plant City mayor, said. Larson’s son, Jesse, is now an adult. When he was 11, he expressed an interest in hunting to his father. But the duo didn’t immediately pack their bags for a weekend in the woods. Instead, Larson brought his son to Tampa-based Arrowhead Archery. Jesse would practice two to three times per week. Larson also insisted his son go through the proper hunter education training. If Jesse could pass the state-approved written test, Larson would take him hunting. Even after Jesse passed his written exam, he still had to follow Larson’s rules when the duo went hunting. They were only allowed to take one animal per person per hunt. Above that, they only hunted an animal if they intended on eating it. Randy and Jesse Larson hunted together for 11 years. Courtesy photo. On one of Jesse’s first hunting trips, Larson brought his son to a farm that was overrun with does near Lake City. When Jesse successfully hunted his first doe on the trip, he was taught to harvest the animal. While doing so, he discovered the doe may have been pregnant. Together, the father-son team took about one hunting trip every year. They primarily went to Texas, where they hunted different types of exotic game. When they hunted, Larson and Jesse sought out the older animals in a given pack. They were able to determine the age by the size of an antelope’s antlers or the points on a deer’s antlers. Randy and Jesse Larson liked to hunt Blesbok and Nyala antelope in Texas. On their trips, the duo could spend up to three days hunting a specific animal. When they got close enough to it, they did their best to take down the animal with one clean shot. The shot would usually be between the heart and the lungs, but organ locations varied by animal. For the Larsons, hunting was never about quantity. When they were invited to a hog hunt in Texas, they declined going. Though the state allows hogs to be hunted all year long, the Larsons decided to decline the hunt because they would be encouraged to hunt as many hogs as possible and leave them in the fields, something that went against their hunting principles. Ultimately, Larson said, hunting was a way of teaching his son about the respect for both the hunting weapons used and other living things.